The Fire Starter Sessions Workshop (Lexington, KY, USA) | Not Another Brittany! Do you have dreams of quitting your 9-to-5 job? Taking the leap into running your own business? Traveling the world full-time? Or creating a brand new life for yourself? I want to help you say YES to your own genius so you can stop doing all the things that are holding you back. Let’s cut through your thoughts, fears, and feelings so we can get crystal clear on your core desires. Using your dreams as fuel to move you forward, we’ll burn your illusions to a crisp so you’ll finally have the courage to live the life you’ve always dreamed of. ***Hot tea, water, snacks and worksheets are included. Dress comfy and bring a journal and a pen. It’s time to create success on your own terms. 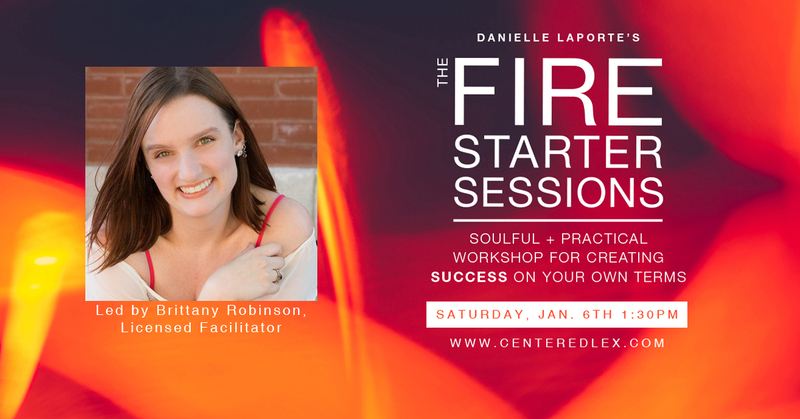 Brittany Robinson is a designer, business coach, Creator of #SelfCareForSolopreneurs and Licensed Facilitator of the Fire Starter Sessions by Danielle LaPorte. After leaving corporate America herself, she now helps new business owners bring their world-changing visions to life (and get plenty of self-care along the way). When she’s not working from home in her pajamas, she travels the world with her husband, Rafael. Core Desired Feelings: Radiance. Freedom. Abundance.